So yes, sometimes they make mistakes in their labeling and classification – don’t worry, they’ll get those figured out over time. But the important thing is that they are starting to make connections and draw conclusions. They are noticing that some things match (are the same based on some criteria) and some don’t match (are different in some way). These are in approximate order from least complex to most sophisticated. Start on the easier side with your child, then gradually escalate up the complexity over time. Comparing related objects: this is bigger than that; this is heavier than that. Put things in order: from smallest to biggest, from lightest to heaviest. Sort into categories that you tell them, such as color. First, do only two categories (separate the grapes from the strawberries.) Over time, add more categories. (Sort the plastic bears into the red, blue, yellow and green bowls.) Or separate the musical instruments from the scarves, then separate instruments, scarves, shakers, and bells. Let them decide which characteristic to sort by…. This blog post on Rhythms of Play does a lovely job of describing a sorting game with a three year old. “Instead of telling your child(ren) how to sort the rocks, ask them if they see any differences in the rocks.” Then let them sort based on that criteria. Her daughter first sorted by size, sequencing them from smallest to largest. “Place the rocks back into a pile and ask what other differences they see. Sort again based on their answer. You don’t need to sort every last rock each time. Some rocks may be difficult to sort depending on the classification. Repeat until you run out of ways to sort and classify the rocks.” Let them know that there’s no right or wrong answer about what criteria to sort by. Her daughter then sorted by color. Then into one pile where all the rocks were one homogeneous color, and one of multi-colored rocks. Do multi-stage classification. First make sets of all the plastic toys and all the wooden toys. Then sort out the plastic blocks from the plastic animals. Then sort out the plastic mammals from the plastic fish. Think about sequencing skills. At the beginning of a preschool year, the teacher might first focus on having children look at two objects and describe – what’s the same? what’s different? Then they’d move up to three objects and the game “one of these things is not like the other.” (check out YouTube for classic clips from Sesame Street). Then they’d look at groups of four objects and find the pairs – which ones match. Then sort 6 – 8 objects into two categories. Then sort 12 objects into three categories, etc. Go Fish, Uno, and other card games: Most card games require that children learn to understand sets and different ways to sort them. Sort into suits – hearts, spades, diamonds and clubs, or by color in Uno. Sort by number / type: your king matches their king; you can play a red card OR a 6 on their red 6; you can get a “straight” of numbers 3, 4, and 5, but only if they’re all the same suit. Again, you can start by either making your own cards, or just use a sub-set from a deck of cards. For example, starting with just ace through 10 in the deck may be easier for your child than trying to understand face cards and remember how many points a jack, queen and king are. Or, when you start playing Uno, only use the number cards – leave skip, draw two and wild cards for the future. Find sets – have them look around classroom (or bedroom or restaurant – wherever you find yourself) and find things that come in sets, like a box of crayons, 6 pack of soda, salt and pepper shakers. Make patterns: If you give your child a bowl of beads, and ask them to make a pattern of black then white then black then white, they have to sort those colors from the bowl. Read books that sort into categories: animals that live on farms and in zoos; trucks and cars; evergreen and deciduous trees, dog breeds by group. Talk about it. Sorting is not just about moving objects around – It can also happen in discussion – name the people in your family and some people not in your family; look at this picture – point to all the animals in the picture. Puzzle cards: Many commercial products (like Laser Maze , Tumble Trax , and Snap Circuits) come with a series of instruction cards that teach skills sequentially – the child first does card #1. Then once they’ve learned that concept, they move up to card #2, which adds one element, and so on. You could create puzzle cards for a sorting activity. For example, put out a set of Counting Bears. Puzzle card #1 says / shows a picture of: Sort the bears by color: red, yellow, and green. Puzzle card #2 says: Sort the bears by size: small, medium, large. #3: Put all the small green bears here and all the big red bears there. And so on. Parts and wholes: Put out several containers and several lids. Have them match the container to the lid. Matching lists: Hold up one familiar object. Ask them to describe it, writing down what they say. Then hold up another object, do the same. Now compare lists. How are they like each other and how are they different? Could also do with a worksheet / form that asked questions in order: color, shape, texture, etc. That would make it easier to compare the lists side by side. Recycling: Help children learn about, and follow, the rules for what gets recycled, what gets composted, and what gets thrown away. Sorting Math Tokens: Teach Preschool has a great post on asking kids to bring in small items for counting games and math games. She describes how they took a big box of miscellaneous stuff, observed it to discern possible categories, then sorted it. Check out all my other posts on this blog about teaching STEM concepts. 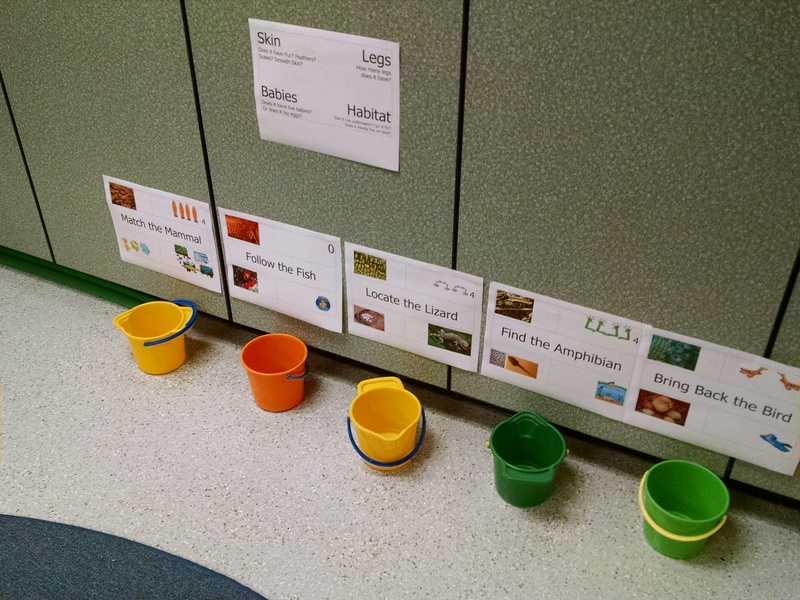 They are organized around weekly theme, but almost all the themes include a sorting activity! Examples: Solid, Liquid, or Gas? Can the Wind Move It? Rock sorting and dinosaur sorting. Sort it Out! Preschool – gr. 2. Packy the pack rat’s collection is too big. His mother has him categorize things and put them away. He finds all the green items, then everything with shells, then everything that falls from a tree – we see that some items fit in two of those categories. (I like the rhyming structure… you can cover up the answer, and read: “the cherry, the marble, the yarn tightly wound, these are examples of things that are…. ” and let your child guess what they have in common that rhymes with wound.” There’s suggested teaching activities in the back of the book. And, online, an AMAZING companion guide for teachers, full of activities. Grandma’s Button Box (Math Matters) K – 1. A girl spills her grandma’s box of buttons, tries to sort them properly again – sorts by shape, then size, then color. Sorting (Math Counts) K – 2. Introduction to sorting, with photos of objects. Prudy’s Problem and How She Solved it K – 2. A girl whose collection has grown too big… very detailed pictures, humorous. Hannah’s Collections P – K. A girl has to decide which of her collections to bring to school. Peaceful Parenting has a great collection of ideas for things to sort: coins, buttons, straws cut to different lengths, sorting by weight or sound, and more. Developing Classification Skills on Design a Study. Zero to Three has a great collection of ideas for how to Help Your Child Develop Early Math Skills.